Being the home of anime, kawaii stuff, and a wide range of children’s attractions, Japan is a popular travel destination for families with kids. But while there are many amusement parks in Japan that promise exciting rides and endless family fun, there are a few that are certainly not for kids. Hidden among Japan’s lush prefectures are old and deserted amusement parks that are not exactly kid-friendly, but adults will definitely enjoy exploring. If you’re into horror flicks, then you will definitely have fun paying one of these theme parks a visit. It’ll make you feel like you’re in your own personal horror movie. If you make it out alive, that is. Built in 1961 and patterned after the original Disneyland in the United States, this theme park used to be the go-to spot for people from all over Japan. It had a replica of almost every attraction in Disneyland, making it popular among children. From the Monorail to the Jungle Cruise, and even Disneyland’s famous Main Street, Nara Dreamland was a deadringer for Disneyland. It was certainly a sight to behold for kids (and kids at heart). However, when a real Disneyland theme park opened in Tokyo in 1983 and Universal Studios opened its doors in 2001, everything went down the drain for Nara Dreamland. Who would go to a faint imitation when they can experience the real thing, right? While it was officially shut down in 2006, Nara Dreamland still continues to be flocked by unofficial tourists. But this time, people aren’t going there for the theme park experience—they go there to be creeped out as they wander, explore, and take pictures of the seemingly haunted ruins of the park. Situated near Mt. Fuji, Gulliver’s Kingdom is a place straight out of a storybook. 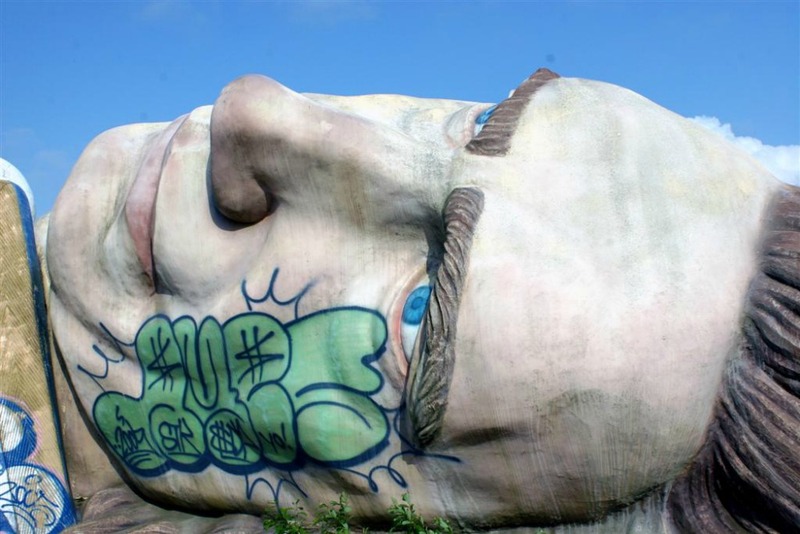 Opened in 1997, this theme park boasted of a giant 147-foot statue of the titular character in “Gulliver’s Travels.” Just like in the story, the Gulliver statue is tied down to the ground by the Lilliputians, serving as the park’s main attraction. It’s ride offerings were meager at best, as it only had a bobsled run and a railway. But this amusement park wasn’t as big of a hit as its creators thought it would be. Many attribute this to its creepy location. The park was built near Japan’s so-called “Suicide Forest,” Aokigahara. It was also near the former headquarters of the infamous Aum Shinrikyo doomsday cult, which was responsible for carrying out a terrorist attack using sarin nerve gas—a chemical nuclear weapon—on five trains in the Tokyo subway system in 1995. Clearly, people didn’t want to be close to areas where their lives could be endangered. Thus, very few people visited this place. Despite being abandoned in 2001, the amusement park retained its picturesque quality until it was demolished in 2007. “It was such a momentous thing to stand in the presence of. It was the most amazing and surreal object I have ever seen. It felt so weird to lie in the palm of a giant man, while surrounded by the stunning scenery,” said photographer Martin Lyle, who was able to capture the ruins of the park in photos before it was demolished. Usually covered in fog in pictures, this abandoned theme park on a hillside is the most mysterious of them all, because it is not on any map of Japan, and no one really knows the exact coordinates of its location. Takakanonuma Greenland also had its own share of issues, like having to be closed indefinitely only two years after it opened in 1973. While others argue it was due to repairs, some say that it was due to the many deaths that occurred within the facility due to the park’s faulty rides and equipment. It did reopen in 1986, but eventually closed down for good during the looming economic crisis in 1999. However, its giant roller coasters, iron statues, and other attractions remained. The fact that many have supposedly died in this theme park, along with the sight of colorful theme park rides rotting and rusting away, added to the haunted vibe of Takakanonuma Greenland. Fancy visiting any of these creepy abandoned theme parks? Better plan an impromptu trip to Japan before they’re gone! It’ll be quite an adventure to see what these sites look like now (and what might have still been left there) after all these years. Wow 😮 I have never heard about these creepy place in Japan 😮 Thank you for sharing. “Usually covered in fog in pictures, this abandoned theme park on a hillside is the most mysterious of them all, because it is not on any map of Japan, and no one really knows the exact coordinates of its location.”, plus the story in the video :-s this park should be the scene of horror movie, this is the scariest one.